Get all your tapes transfered to DVD or digital media. We do it professionally! Home Video Studio is the leader in video to DVD transfer. We have been transferring tapes since 1991 and have transferred literally millions of feet of tape. 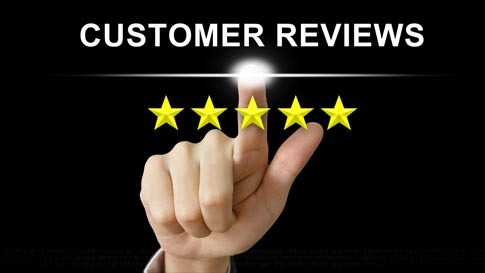 We Professionally inspect every every tape you give us and make sure it's done right! 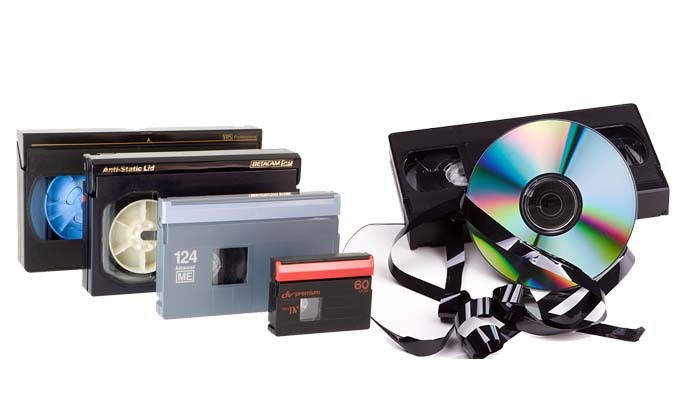 Bring us your old home movies and video tapes - we'll transfer them to DVD for you. VHS, VHS-C, BETA, 8mm video, Mini DV, and of course, your old 8mm and 16mm movies. Here is more information about our Video to DVD Transfer services. We call it HVS DVD Deluxe. We'll put your video onto a Platinum Archival DVD. Every DVD has scene selection "smart chapter markers". Our proprietary DVD Deluxe system detects where your video camera stopped and started or the scene changed. Chapter markers are placed at these points so you can easily skip through your finished DVD. We have many themes to choose from so if this is your wedding from six years ago or your baby's birth from six months ago, we will choose the appropriate theme. Ask about an upgrade to our album case with custom insert and thumbnail photos of your video on the outside. We specialize in obscure formats and can easily repair any tape you have! Can you transfer VHS to DVD? Yes we can! Each VHS tape is transferred to its own Platinum Archival DVD. This DVD uses a platinum reflective layer that provides maximum protection from scratches and environmental degradation, making it the ideal media for your precious videos. And if some of your VHS tapes have become damaged don't worry. We know how to repair them so we can get your old video onto DVDs for good! Can you transfer VHS-C to DVD? Yes we can! VHS-C is the compact form of VHS that was popular for a short time. VHS-C tapes have their own idiosyncrasies but we are familiar with them and know how to achieve a good result with your valuable content on them. After capture we transfer each VHS-C tape to its own Platinum Archival DVD where the content can be stored and protected for many years to come. Can you transfer DVD to Video? Yes. We can take your DVD and copy it, transfer it, edit it and put it on your website if you like. Can you help me put a video on You Tube? Yes we can! YouTube has certainly changed how we share our lives with the world! Knowing the ins and outs of things like editing formats and compression is essential to a successful uploading to YouTube. We take pride in knowing what it takes to do this and would love to help share your video with the world on YouTube. Where can I find a VHS-C adapter? VHS-C adapters are becoming more difficult to find and they cost money. The beauty of Home Video Studio is that you won't need to spend time or money locating a VHS-C adapter. We have them right here! Once processed each VHS-C tape is transferred to its own Platinum Archival DVD - rated to last 100 years. Can you transfer S-VHS to DVD? Yes we can! Many of the older and "experimental" formats used equipment that may or may not be readily available these days. At Home Video Studio we make it our business to have the right equipment so you can transfer your precious video to a contemporary format. Each S-VHS tape is transferred to its own Platinum Archival DVD. These DVDs are rated to last 100 years and are extremely scratch resistant. Can you transfer 8mm to DVD? Yes we can! 8mm tapes can have some delicate tracking problems. We take pride in having the right equipment to guarantee a successful outcome. Once we capture your video we transfer them to a Platinum Archival DVD. Providing maximum protection for your precious videos, these DVDs are rated to last 100 years. Can you transfer Hi-8mm to DVD? Yes we can! Hi-8 is yet another format in the 8mm family. You would need another special deck or camera that may be difficult to find, but not at Home Video Studio . Each Hi 8mm tape, once captured, is transferred to its own Platinum Archival DVD. These DVDs are rugged and durable - rated to last 100 years! Can you transfer Digital 8mm to DVD? Yes we can! Do you have several digital 8mm tapes but nowhere to play them? Has your digital 8mm camera quit working and you can't find another one? Or perhaps you found another 8mm camera but it won't play your tapes correctly? We specialize in the right equipment to play back your older formats. Then, once transferred we'll put it on a Platinum Archival DVD and you won't have to worry about your precious memories again! Can you transfer Digital Hi 8mm to DVD? Yes! Hi 8mm was the intermediate format between analog 8mm and digital 8mm. We have the equipment to transfer these. Each Digital Hi 8mm tape is transferred to its own Platinum Archival DVD. These DVDs are rated to last 100 years. Can you transfer Mini to DVD? Yes we can. We specialize in this. Bring us your Mini DV (Digital Video) cassettes and we will transfer your Mini DV to DVD. Each Mini DV tape is transferred to its own Platinum Archival DVD. These DVDs are perfect for your Mini DV's as they are rugged and durable, and are rated to last 100 years. Can you transfer DV-Cam to DVD? Yes we can! We specialize in this. DV-Cam is the professional form of Mini DV. The decks used to play these tapes are not readily available to consumers but at Home Video Studio we make it our business to have all the equipment necessary for any format. Each DV-Cam is transferred to its own Platinum Archival DVD. These DVDs are rated to last 100 years. Can you transfer 8mm film to DVD? This is our specialty. Please go to our Home Movie Transfer page. Can you transfer Super-8 to DVD? Yes! This is our specialty. Please go to our Home Movie Transfer page. Each Super-8 reel can be transferred to its own Platinum Archival DVD. These DVDs are rated to last 100 years. Can you transfer 16mm film to DVD? This is our specialty. Please go to our Home Movie Transfer page. Each 16mm film reel can be transferred to its own Platinum Archival DVD. These DVDs are rated to last 100 years. Can you transfer 8mm Sound Film to DVD? Regular 8mm sound film is extremely rare and the projectors used to play them are even rarer. Please give us a call to discuss your options if you have Regular 8mm sound. Can you transfer Super 8mm Sound Film to DVD? Yes. Sound 8mm used to be very popular, and what a treasure to not only see loved ones from years ago but to hear them as well! We use frame-by-frame digital capture and then transfer your sound film to Archival Platinum DVD. Can you transfer 16mm Sound Film to DVD? 16mm sound comes in two formats. One is called magnetic sound, the other is called optical sound. We have the equipment to do both and consider this one of our specialties. Please go to our Home Movie Transfer page for more information. I want to do a Video Transfer of my old BETA Tapes. Can you copy BETA to DVD? We have Sony BETA source VTRs that we keep in mint condition to transfer your old Sony BETA tapes to DVD. Just call us today. Each Beta tape is transferred to its own Platinum Archival DVD. These DVDs are rated to last 100 years. Can you copy Betamax to DVD? Yes. This is basically the same as BETA (also called consumer BETA). We can help you with getting your old Betamax tapes transferred to DVD. Each BetaMax tape is transferred to its own Platinum Archival DVD. These DVDs are rated to last 100 years. Can you copy Betacam to DVD? Yes. This is the professional form of Betamax. It was very popular with TV stations and professional videographers in the 1980's and 1990's. In fact some TV stations still use this format. Home Video Studio specializes in transferring Betacam to DVD. Call us for a quote today. I have a U-matic cassette tape. Can you transfer it to a DVD? Yep! Look no further. U-matic or Three-Quarter (3/4") tapes were a popular professional format in the 1980's. We specialize in transferring these U-matic cassette tapes to DVD. I have a 1 inch tape. Can you transfer it to a DVD? Yes. 1 inch videotape was the broadcast standard for years. Call us today if you have a 1 inch tape that you would like transferred to DVD. Can you transfer Video from a Camcorder? Yes we can! 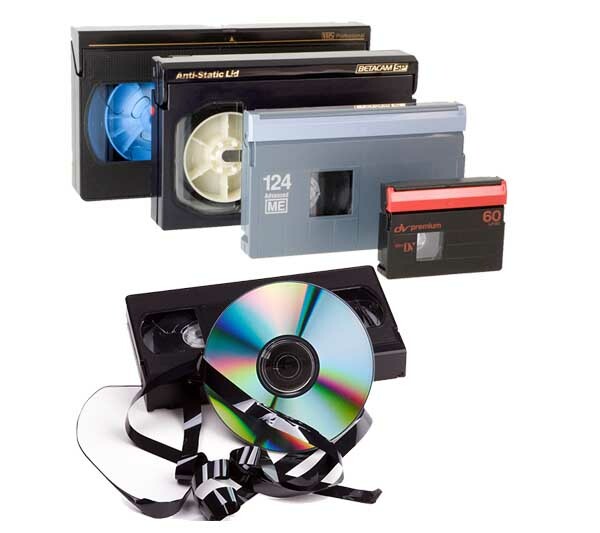 If your camcorder still plays your tapes, or if you have a mini-disc or hard drive in your camera we can transfer that video content to a Platinum Archival DVD. This is the best way to ensure your videos last, since these DVDs are extremely scratch resistant and rated to last 100 years. Can you transfer Video from a SD Card? Yes we can! These formats are very popular for digital cameras. Call today for more information on transferring Secure Digital (SD Cards) to DVD. To archive these we can transfer them to Platinum Archival DVD. These DVDs are rated to last 100 years. Can you transfer Video from a Hard Drive to DVD? If your video and pictures are on a Hard Drive and you would like us to transfer the images to DVD, call us today. We can provide this service. Mac or PC. Once transferred we can put each file transferred to its own Platinum Archival DVD. These DVDs are rated to last 100 years. Can you transfer a C120 Audio Cassette to CD or DVD? Yes. Copying of audiocassettes to CD or DVD is another area of speciality for us. We have the right equipment to take audio from a cassette tape and put it on a digital format. Will also make sure everything's set so that it's the highest quality available. Can you transfer a Micro Audio Cassette to CD or DVD? Yes. Micro Audio Cassette is an older format and should be tranfered right away before this technology is completely obsolete. Call us today! Can you transfer a Wire Audio Recording to CD or DVD? Yes. These are the old very primitive audio recordings. It almost appears as if it is fishing line. But it is not. It is actually a magnetic wire recording which we will transfer to CD for you. Call us today! Can you transfer a Reel-to-Reel Audio Tape Recording to CD or DVD? Yes. There were several varieties of Quarter inch (1/4") Reel-to-Reel audiotapes. We transfer all Audio reels to Cd. Call for an estimate today! Can you transfer a Floppy Disk to DVD? Yes. If your Floppy Disk has images which you want transferred to CD or DVD, give us a call today. Can you transfer a Mini DVD to DVD? Yes. Make sure your Mini DVD is finalized before you come in. If you need help with finalizing give us a call today. Each Mini DVD can be transferred to its own Platinum Archival DVD. These DVDs are rated to last 100 years. Can you repair a damaged VHS Tape? Yes we can! We will need to inspect the damaged tape for to see if it can be repaired, but each VHS tape can transferred to its own Platinum Archival DVD. These DVDs are rated to last 100 years. Our VHS TAPE was damaged by water, smoke or fire. Can you Repair it? We will need to inspect the damaged tape for to see if it can be repaired, but each VHS tape can transferred to its own Platinum Archival DVD. These DVDs are rated to last 100 years. Can you transfer Compact Flash Card to DVD? Yes we can! We specialize in having all the equipment and knowledge to ensure the best transfer of sound and images to DVD. And remember, we put everything on Archival Platinum DVDs for the most scratch resistant and degradation resistant media. Can you transfer AVI Files to DVD? Yes we can! Our knowledge of file types and codecs will ensure you get the best quality possible from your video transfer. And, each file is transferred to a Platinum Archival DVD. These DVDs are rated to last 100 years. Can you copy Video to DVD? Yes we can! Actually there are several things we can do with your existing DVD. We can make a straight copy of it. We can transfer it to another format. We can capture its contents and edit it taking things out, putting things in, adding titles and/or music, voiceover, etc. Your imagination is the limit. We can also put it up on your website if you like. Call us today! Can you convert my video to an Internet Video? Yes!, we can convert any file format to WMV, MOV, optimized for the internet, etc. We can also convert video to flash flv or swf. Can you convert my Flip video to a DVD? Yes!, we can convert Flip video files to DVD. And you can enjoy your Flip video for years to come because we will transfer it to Archival Platinum DVD for the most scratch resistant and durable media available. We can also help you upload those to YouTube!